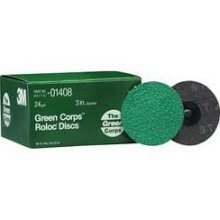 3M Green Corps 3" Roloc Discs. 25 discs per box. The versatility of 3M Roloc product with the quality of Green Corps product. Generally used for hard to reach areas in paint, rust, and weld removal. Handy, quick change tool for disc grinding which fits and standard 1/4" drill or air tool. Quick 1/2 turn on, 1/2 turn off speeds disc changing and cuts down time. Color coded so the grit of any disc can be determined by the color of the plastic holding button.